California will hold a hearing this week on offering a $4,500 subsidy for each electric vehicle sold in the state, up from the current $2,500, even as customers from Tesla Inc. and General Motors Co. face the loss of even bigger federal credits. The federal government now offers a $7,500 tax credit on electric vehicles sold. The credit is designed to start ratcheting downward once the companies have grown enough to sell a total of 200,000 vehicles each. Tesla passed this threshold in July and GM is getting close. The higher California rebates come as President Donald Trump is arguing that only the federal government can regulate tailpipe emission standards or mandate EV sales. Last month, the president also proposed freezing federal fuel economy requirements at 37 miles per gallon in 2020, instead of letting them rise to 47 mpg by 2025 as planned by former President Barack Obama. This would also freeze greenhouse gas limits, but so far, California is refusing to back down. "At the end of the day, California officials looked at the data, came to a different conclusion than Trump, and are proceeding with the authority they already have under the Clean Air Act,'' said Don Anair, research director for clean vehicles at the Union of Concerned Scientists. The state, the nation's largest new-vehicle market, is able to consider an increase in its EV subsidy partly because revenue is becoming available as companies buy more credits to comply with the state's Low Carbon Fuel Standard, said Dan Sperling, a University of California Davis transportation professor who is also a member of the Air Resources Board. At this week's hearing, the board will consider boosting the required low-carbon content of its transport fuels to 20 percent by 2030, from 5 percent this year. California may provide this portion of its subsidies directly to consumers at the point of sale, rather than via mail rebates later, as proposed by automakers, electric utility companies and others. The state's current $2,500 electric-car rebate comes from a different source: the purchase of credits to comply with the state's cap-and-trade program for reducing carbon-dioxide emissions. 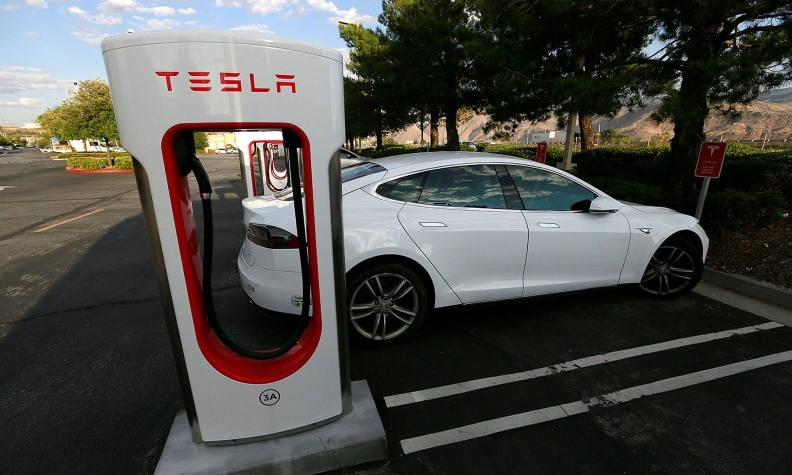 At meetings Thursday and Friday, the Air Resources Board will also look at heftier subsidies for fast-charging facilities for EVs and hydrogen stations for fuel cell vehicles, Sperling said. The board also may mandate that urban transit systems buy only battery-only or hydrogen-powered buses by 2030, he said. The state's electric utilities have emerged as enthusiastic backers of such measures, Sperling said, as rate-payer funded charging stations provide a new source of revenue. Additionally, the board plans to vote on whether to force carmakers to continue complying with Sacramento's greenhouse gas limits, even if Trump weakens those set in Washington. California has formally linked its greenhouse gas targets to Washington's since 2009. But in Friday's vote, the state will decide whether to stop doing so if the federal government starts making unilateral changes in its standards now, Sperling said.